Football is an exceptionally popular sport in North Carolina at the high school, college, and professional level. 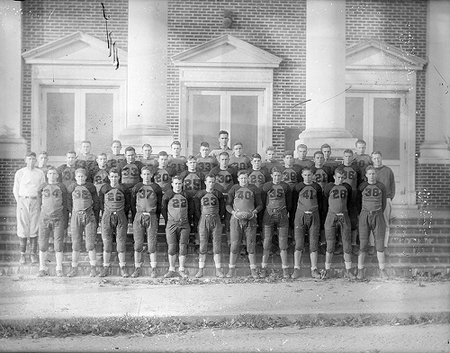 The first colleges to field football teams in the state were Trinity College (later Duke University), the University of North Carolina in Chapel Hill, and Wake Forest University. The first intercollegiate games were played in 1888. Many of the state's football pioneers, most notably Trinity president John Franklin Crowell, learned the game on northern campuses. North Carolina A&M (now North Carolina State), Davidson College, and other schools started playing football in the 1890s. Livingstone College hosted Biddle Institute (now Johnson C. Smith University) on 27 Dec. 1892 in history's first intercollegiate football game played between black colleges. From its inception, college football has been controversial. Fears of violent play and professionalism, as well as questions concerning the proper degree of emphasis of football on campus, have plagued the sport. Trinity, Wake Forest, and Guilford all banned intercollegiate football for lengthy periods, although all eventually reinstated the sport. In the 1930s University of North Carolina president Frank Porter Graham unsuccessfully attempted to reform certain aspects of the football culture. Despite these concerns, college football's impact has steadily increased, not just as a form of recreation but also in financial terms. The construction of increasingly larger stadiums, the growth of the alumni and fan base, and the development of radio and television have made the sport a significant campus revenue producer. North Carolina college football became nationally prominent with the 1931 arrival of Wallace Wade at Duke and the 1934 arrival of Carl Snavely at UNC. Duke hosted the California-based Rose Bowl on 1 Jan. 1942, after fears of possible Japanese attack nearly forced its cancellation. The post-World War II explosion in college enrollment led to something of a golden age in college football, both in North Carolina and across the nation. UNC halfback Charlie "Choo-Choo" Justice, who played from 1946 through 1949, became a North Carolina folk hero for his on-field exploits and later played in the National Football League (NFL). UNC, Duke, Wake Forest, and North Carolina State were charter members of the Atlantic Coast Conference, the dominant college league in the state since its 1953 formation. All four schools have had a mixture of outstanding and less-competitive teams. Most North Carolina college teams became racially integrated in the late 1960s. Smaller colleges such as Lenoir-Rhyne, Elon, Appalachian State, and Western Carolina have been nationally competitive at a lower level. In the 1960s East Carolina University president Leo Jenkins used that school's expanding football program to promote its growth plans. Since the 1930s, colleges in North Carolina have also produced players who went on to play professionally in the NFL. Former Duke players Clarence "Ace" Parker, George McAfee, and Sonny Jurgensen are members of the Pro Football Hall of Fame, as is former Wake Forest player Bill George. The list of other NFLstars that played at North Carolina colleges includes Lawrence Taylor, Natrone Means, and Julius Peppers (UNC); Earnest Byner and Jeff Blake (East Carolina); Brian Piccolo, Norm Snead, and Ricky Proehl (Wake Forest); and Alex Webster, Roman Gabriel, Randy White, and Torry Holt (N.C. State). Dozens of other professionals hailed from North Carolina towns but played their college football at out-of-state schools. Not all North Carolina football is played on college campuses. Youth teams abound in the state, and most high schools field football squads. The North Carolina High School Athletic Association has held state football championships since 1913. The organization controls all levels of high school football competition, establishing conferences and placing teams into classifications based on the size of each school's student population (ranging from division 1-A schools, the smallest, to division 4-A schools, the largest). Several of the state's larger cities have had minor league professional football teams, including the Charlotte Bantams in the 1930s and the Charlotte Clippers in the 1940s. The Charlotte Hornets played in the World Football League, an unsuccessful challenger to the NFL, in 1974 and 1975. Football in North Carolina entered a new era on 26 Oct. 1993, when NFL owners unanimously selected Charlotte as the host city to the 29th NFL franchise and the first expansion team since 1976. Fireworks exploded over the town, where the Carolina Panthers would play in a new 72,300-seat stadium, as jubilant fans gathered to celebrate the end of a bid process that had begun in 1987. Owner and founder Jerry Richardson became the second former NFL player to own an NFL team (after George Halas of the Chicago Bears). In their inaugural match-up at the preseason 1995 Hall of Fame Game in Canton, Ohio, the Panthers defeated the Jacksonville Jaguars 20 to 14 to become the first expansion team in NFL history to win its initial contest. Their seven first-season wins more than doubled the previous record of three victories by an expansion team in its first year. The Panthers improved dramatically during their second season, advancing to the National Football Conference championship game and moving from their temporary home in Clemson, S.C., to their new stadium in Charlotte. They reached their first Super Bowl during the 2003-4 season, winning their division and three playoff games before losing to the New England Patriots in Super Bowl XXXVIII by a score of 32 to 29. Bill Beezley, The Wolfpack: Intercollegiate Athletics at North Carolina State University (1976). Ted Mann, A Story of Glory: Duke University Football (1985). Ken Rappoport, Tar Heel: North Carolina Football (1976). Jim L. Sumner, A History of Sports in North Carolina (1990).